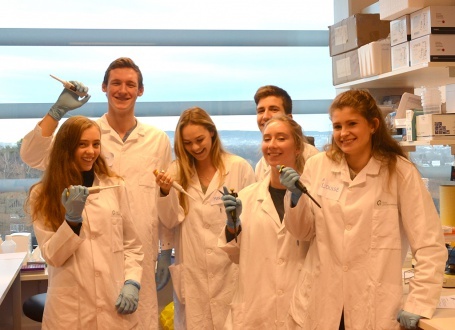 As part of the collaboration between Oslo Cancer Cluster and Ullern high shool, a total of 40 students visited six different laboratories at the Oslo University Hospital and the National Institute for Public Health last week. A journalist from Framtida.no interviewed the six students who visited the Department for Tumor biologi. Researchers Siri Tveito and Karen-Marie Heintz guided them through immunoflourescence, PCR, gel electrophoresis and other techniques in the lab, and the students were eager to learn about the life of a cancer researcher.